Went to a children's museum yesterday. Enjoy the pics. here she is, demonstrating how to play a new game. She is wiggling under the thing-a-ma-stick with the fish between her knees. ﻿Here's Hubby, skipping around the thing-a-ma-stick with the fan under his chin. I'm not quite sure how he's gotten this far in life not knowing how to skip, but it sure does make for some hilarious entertainment. So here we are, visiting with the Ds. The kids are in bed, and we've got 3 laptops and an iPod going. Aren't we the wild bunch?! And we're planning on doing it again tomorrow night to ring in the new year :-) Yee haw! ESheppy accepting his prize--he sure looks thrilled, doesn't he? Mmmm! That cake was delicious! And no, she didn't have to blow out 85 candles--we would have been there all night. I had the privilege of attending a celebration in honor of my Grandma's 85th birthday this week. Her entire family, including three children, four grandchildren, and 7 great-grandchildren, was in attendance--something that hasn't happened in my memory (I think maybe everyone was at my Aunt's wedding in 1976, but we've added quite a few family members since then). We had such a great time--my Dad's family is such a hoot. Just to give you an idea, the evening after the party, we all got together at my Aunt's house. After supper, the kids watched a movie and the grown-ups played cards. We were laughing so much that the kids actually told us to quiet down--we were being too noisy for them to hear their movie! Many thanks to my Aunt Sue for organizing the get-together. We got about another 4 inches of snow yesterday, and I spent about 2 hours clearing snow from our driveway this morning. Luckily, I was able to clear the length of the driveway before the snowblower decided it was done for the day, so I only had to shovel our walk, and the wide area of the driveway close to the house (I've saved the turn-arounds for Code-man to do this evening). I actually quite enjoy shoveling snow. It's the perfect mindless physical activity to induce in me a sense of peace. It makes sense, really, that shoveling would be soothing to my soul. We were encouraged, when I worked with adults with developmental disabilities, to offer gross motor activities to calm our consumers who had sensory issues, and those scientific types are constantly telling us that exercise promotes manufacture of those "feel-good" hormones: endorphins. And let's admit it: there is something so satisfying in doing a task in which progress is noticeable and measurable, and completion is attainable. Today is the first day of winter, although, with all this cold and snow, it certainly seems as if it's been winter for quite some time. I, for one, am thrilled that, after today, the days will become longer again. It has been so dark, so cold, so barren, so winter-ish, in so many ways, for so long, and it is fitting that, as we celebrate the arrival of Hope to light our dark world, our days will become more light-filled, hopefully in more ways than one--I hope and pray that the Light will overcome all of the darkness. and notice the "war paint" on the littler one. Almost makes me wish we had some little girls in the family, since flowers are the only thing I know how to paint. Almost. As I mentioned in this post, we're counting down to Christmas using an Advent calendar this year. Each day we read a Bible verse or two, and there's a question for us to consider. Yesterday, we read, "on coming to the house, they saw the child with his mother Mary, and they bowed down and worshiped him. Then they opened their treasures and presented him with gifts of gold and of incense and of myrrh," (Matthew 2:11) and, "the King will reply, 'I tell you the truth, whatever you did for one of the least of these brothers of mine, you did for me.'" (Matthew 25:40) And the question to consider was, "why do we give gifts at Christmas time?" Code-man said it was because we're celebrating Jesus' birthday (but then why do we give gifts to each other, instead of Jesus? ); Logo, typically, said, "Whaaa?" and had to be asked the question multiple times before parroting his older brother's response. Bubby said, "baby Jesus!" which is probably as good an answer as any. Sawblock said something about giving to others because when we give to others we're giving to Jesus, which seems to have been the intended response, based on the verses we read, but then, I don't consider myself, or most of the people I usually give Christmas gifts to, to be "one of the least," so I'm not sure that's really it... And I just sat there with a cryptic look on my face, pulling a "Mary" (that is, pondering all these things in my heart--you've got to admit, I'm quite the ponder-er). This is a question that I have considered in the past, and if you want, you can refresh your memories about my past thoughts on the subject by reading this post and this post, and maybe even this post (even though that one's not about gifts), but I've never really come upon a satisfying answer for why we give gifts to each other at Christmas time. When I'm feeling optimistic, I'll say it's because we're commemorating the gifts of the wise men. Or even that, when faced with the overwhelming, ultimate gift of salvation, given to us in the person of Christ, we feel compelled to respond by giving a gift ourselves. And, since it's difficult to give gifts to God, we give them to whoever's handy, which is usually the people we hang out with, like friends or family. What it really comes down to, though, is most of us give gifts at Christmas time because it's expected, and no one's quite sure why anymore. Christmas has become a giant, commercialized monster, it seems, and the true meaning of Christmas is not as important as finding and giving the one (or ten) perfect gift(s). I've been feeling kind of sad this Christmas season, because no one is going to be giving me Christmas gifts this year*. I didn't understand why I was feeling this way, because while I do love receiving gifts, it's really not at all about the stuff for me--I'm just as happy to have someone give time or money to a charity in my honor, or to have someone spend time with me, as I am to receive an actual physical item. For me, it really is the thought that counts--the gift is, in some ways, irrelevant. And then it dawned on me: the top reason that folks have given me for not wanting to exchange gifts is that when they need or want something, they just go out and buy it, so they don't really need or want anything (from me) for Christmas. The reason I was bummed was because no one wants me to give them gifts for Christmas this year. A couple of weeks ago, I spent about an hour and a half in Target, shopping for gifts for the Tubman Alliance Christmas party that our church is hosting tonight, and hosts annually. Tubman Alliance provides support and resources, and a place to stay, for women, and their children, who have fled domestic violence, and/or are dealing with mental illness or addiction issues. I had so much fun, chatting with Bubby about the merits of various potential gifts, rummaging through my coupons, trying to get the most for our money, picking out items. We didn't have a list, we just followed where the Spirit led, praying for the children who will receive these gifts, and it was pure delight. This year, these little boys and girls, who otherwise would have had nothing, will open the gifts that we selected for them, and find, in the midst of this dark time in their lives, the light of hope, in the form of Jesus. That's right: these gifts may look like a doll, or a lego set, or a paper guitar, but these children are getting Jesus for Christmas this year, all wrapped up with a bow. And Jesus is getting, hopefully, them. I'm still not sure of the why of Christmas gifts--if any of you has an answer, theological, or otherwise, feel free to share--but I do know that I found the true joy of giving that day in Target. Maybe that's what it's about. Speaking of gifts, if you're lucky enough to be giving any this season, you can make potato printed wrapping paper to wrap them in, just like we did! I rolled out a dining-room-table length of brown kraft paper, and taped it to the table. Then I made some potato "stamps" (to make the stamps, cut a potato in half, then stick a small cookie cutter into the cut side, as far as it will go. Use a sharp knife to cut into the potato around the cookie cutter, lift the excess potato away, remove the cookie cutter, and there you go--beautiful, symmetrical shapes, that actually look like what they're supposed to be)--we had a heart, a snowflake, a star, and a tree. The kids applied paint to the stamps using foam brushes, and then stamped away. Valerie over at Frugal Family Fun Blog would be so proud! And yes, as usual, this activity soon degenerated into finger painting. When Pal's mom came to pick her up, Pal presented the wrapping paper to her mom, and mom informed me that Pal wrote in her letter to Santa that she wants wrapping paper for Christmas this year. Who knew? And Santa, you're welcome. And speaking of Valerie and gifts, wouldn't an iPad make a terrific gift? Thanks to Target, Valerie gets to give away a terrific prize package! You can go to Frugal Family Fun Blog to enter to win an iPad and an assortment of children’s books courtesy of Target! * I do need to mention that my husband (who just happens to be the best husband in the world that I am aware of) is giving me gifts for Christmas this year (but that's not why he's the best), so it's not really no one, but there is a "but," which I have discussed with my husband, that allows me to make that statement. Oh, and please don't run out a buy me a gift now--I didn't share that to guilt anyone into giving me stuff--just being real. And the reality is, if any of you had wanted me to give you gifts this year, I wouldn't have had the opportunity to experience this joyful giving transformation. Just so you know, this prize drawing was conducted by an impartial 3rd party, so it's absolutely above board and fair. This reminds me of the time that it snowed 39 inches at our house in about 30 hours, back in 2003, on President's Day. Code-man measured 22 inches in a non-plowed, undrifted area of our driveway this morning. That's a lot of snow....I was kind of hoping for a snow day tomorrow, but there's not much chance of that. We're hardy around here, doncha know. It'll take more than a little snow to slow us down. That big snow in WV had everything shut down for a week! Here's little Code-man, back when he was an only child (but not for too much longer), jumping off our back porch into the snow. I think it was taller than him! Code-man's illustrated tutorial: how to make a snow bed, in 4 easy steps. <> And here's what my Hubby was doing, pretty much non-stop, from the time he woke up on Saturday until he went to bed, and he was back at it again today. So this is my 400th post (at least I think so). Yay! 12 inches of snow and still falling? High temp below 0 on Sunday and Monday? Bring it on! And have you seen my brother's blog lately? No threat, my pine trees! You can bring it, too, brother. Whoops-a-daisy! I was afraid of something like this: I went through my list of posts, and discovered not one, not two, but five unpublished drafts that were counted in my total. So that wasn't my 400th post. This isn't even my 400th post. *Sigh* But we won't let that stop us! Anyway, I'm new at this giveaway stuff, so you'll have to forgive me for not specifying a deadline for the candle giveaway. How about... Thursday, Dec. 16 at 8 a.m. CST? That good for everybody? Isn't this exciting? Don't forget to leave your comment here (by the way, as of this writing there's only one qualifying comment, so you have an excellent chance of winning :-). So, if you know me at all, you know that I love to be outside. It doesn't matter whether I'm having a horrible day or a terrific day, my day always gets better if I can spend some time outside. Yes, even when it's 5 degrees outside. And, surprisingly enough, even when it's 90 and humid (although I tend to retreat back to the indoors or at least jump in a lake faster on those sorts of days). So after our grandma cracker building adventure, we bundled up and headed outside for some fun in the snow while we waited for the bus. Just as an aside, I love my new snow bibs! 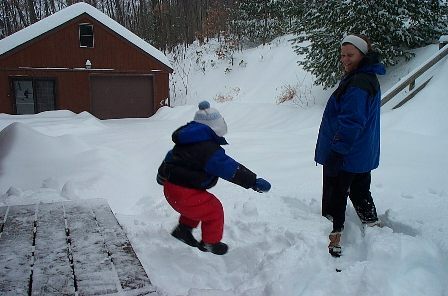 But then, I knew I would--my snow pants kept falling down, which was sooo not fun, and they were too long, too. But the bibs are comfy cozy warm, and didn't fall down, or even threaten to. Logo made a switch Wednesday, too, from bibs to pants, and loves them almost as much as I love my bibs, because...and how can I put this politely? It's easier for him to...use the restroom. If you come to our house, watch out for yellow snow, and that's all I have to say about that. No, I didn't put the little ones into a cage--this is a fort (couldn't you tell? ), and the door's on the other side. Code-man and Logo having a sit-down snowboard race. Pal and Bubby had a sled race, too, which I videoed, so I don't have a pic, but Pal headed straight for me, and ended up sliding right through my legs! You know how when you're seeing something on a screen, it slows down your reaction time (well, it does for me, anyway)? I couldn't get out of the way, so I just made a bridge and hoped for the best. We sure had a good laugh about that one! Code-man catching some "rad air." And yes, he did land this jump, as well as several others. 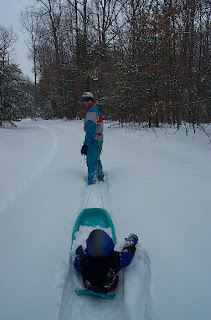 And yes, his mommy winced every time he did it--I foresee broken bones in our future. I'll post a video as soon as I find the jump drive (ha, punny!) and get to the library sans children (or the Hubby breaks down and starts shelling out the bucks for satellite internet--yikes!). So what made this the best morning? It all seems so ordinary--what was so special about it? Well, I think for me, it was its very ordinary-ness that made it so special. Once again, I had the opportunity to spend some time simply having fun with some of my very favorite people in the world. ﻿Ahhhh...this was my view, as I was lying on my back in the "boat" the kids made out of snow. A tiny glimpse of heaven--what could be better? This week, a friend of ours from when we lived in WV has been posting "Perhaps today..." each day as his facebook status. I thought I knew what he was talking about, but not wanting to assume (because you know what that makes of u and me), I gently queried. I received a response in the form of today's post, "Perhaps today...He will return!" I must admit, my first thought, after the initial, "ah ha, I was right," was, "not likely." But that is so not true. We don't know the day or the hour, and just because it hasn't happened on any of the days of my thirty-something years so far, doesn't mean that today won't be the day. Part of being a Christ-follower is living in anticipation, yearning for the day Christ will return to establish His everlasting kingdom on earth, and believing that day will come. And part of being a Christ-follower is striving, every day, to share a glimpse of the kingdom of God on earth to those who desperately need to see it, to experience it, to bring His kingdom closer, right now, today. So, my friends, are you ready? What are you doing today to prepare for that day, someday? Wow, folks! Welcome to The Accidental Blogger's 400th (!) post! In honor of this momentous occasion, I'll be hosting a giveaway (tee hee! I love the sound of that :-). One lucky reader will win a lovely Apple & Cinnamon Velvet 40 hour candle that I got for free using a coupon--smells yummy! Just leave a comment, telling me what you like best about The Accidental Blogger, to be entered into the drawing, and I'll draw the winner's name out of my hat, or maybe just choose the response I like best. Please note, if you read my blog via email or facebook, you will need to actually go to my blog (http://bluefield5.blogspot.com/) and leave a comment to enter. So yesterday, I told you that I had the best morning (I'm such a tease), and now I'm going to tell you about the first part of my great morning (stretching it out for all it's worth...by the way, my brother claims he's no threat to me this month, but I don't think I can afford to become complacent). Our school district had a late start yesterday--they do this about once a month to give the teachers time to do whatever it is teachers do when their students aren't around, so in addition to Bubby and Pal, I also got to hang out with Logo and Code-man for an extra 2 hours yesterday. We started with home made, whole wheat, chocolate chip waffles for breakfast--yum! And then, Gingerbread Week continued over at Camp Scarlet, as my friend J refers to this crazy place (of course, she uses my real name...), with the construction of graham cracker gingerbread houses (or, as Pal would say, "Grandma cracker" gingerbread houses). I put about 1/4 c. of mortar...I mean frosting...into snack sized ziplock bags, then snipped off a corner, so the kids could pipe their own mortar onto the structures. Logo was pretty sure he wasn't going to be able to do it without help, but he proved himself wrong! Here's Code-man, adding pastel mint-chip Christmas lights to the side of his gingerbread chapel. Later, he added a bell to the bell tower (and ate the roof, since it kept collapsing on him--but not before making a valiant effort to save the roof, making braces from various edible materials, until it became obvious that nothing was going to work). To the cloud! Two out of four isn't bad, right, considering that I'm cloud-less? Here are the finished structures...and Pal eating a grandma cracker. Oh, how lovely...a beautiful Christmas display. Looks like that camel is about to take a bite out of Code-man's chapel, doesn't it? We had so much fun! Really. I wasn't expecting to, because generally when we do projects of this type, the children need too much help for me to actually enjoy the process. After all, there are 4 of them, and I only have 2 hands (and only one brain, which is the real problem). But it was so great to witness each child use his individual creativity to create his own unique creation (whoops, where's my human thesaurus now?). I think the real joy came from letting go of any preconceived ideas I might have of how this process should go, and just letting the activity unfold through the ideas and actions of the kids. It's really not about the finished product, not at all. It's about the process, and, even more, about spending time with some of my very favorite people. Stay tuned...up next, Best Morning, part 2. I just had the best morning...but I can't tell you about it, yet. I was going to do just one big gingerbread post, but judging from my brother's rate of blogging already this month, now that he's tasted victory, he's competing in earnest. And I can't let him win in the last month of the year, can I? Got to keep up my momentum, such as it is. You're right: it's really Bubby and Pal with their new gingerbread friends in front of their faces. We were channeling our inner Frugal Family Fun with this fun and inexpensive project. First, I cut gingerbread shapes out of paper grocery bags, and then I held two shapes together, while the kids punched holes around the perimeter. Next, we decorated our ginger boys, using craft supplies we already had on hand...and boy, did we decorate! Elmer's school glue (I would use tacky glue if I were to do this project again) was used in copious amounts, as well as pom poms, cotton balls, sequins, googly eyes, beads, and foam shapes. Next, I glued the shapes together, leaving an opening for stuffing. I stuffed them with pages from the Fleet Farm ad (the best store ever), and glued the opening closed. If I were to do this activity again, I think I would have done the gluing and stuffing before the punching and decorating. Voila! Cookie and Gillian were born. Our family had kind of an unconventional Thanksgiving weekend this year. We didn't go anywhere, and no one came to visit us, so it was just our little family, and we were free to do as we pleased, without regard to tradition or convention. The kids didn't have school on Wednesday, so we spent the morning at our favorite inflatable playground, after which we ate lunch out, and then I dragged the boys along with me to Michael's (that's a craft store, just in case you didn't know) to dream and be inspired (I'm pretty sure I'm the only one who left feeling inspired). We spent Thursday at a water park, which was so much fun--we splashed and played the day away. It was a little odd; each time someone wished me a "happy Thanksgiving," I felt a little jolt, and thought, "yup, it is, isn't it?" I kept forgetting. We ended up at Old Country Buffet for supper, because it was the first place we came to that was open at 6:15 on Thanksgiving--it was the first time for Logo and Bubby, and Code-man was too young to remember having been there, so it was new for all of them, and they were just so tickled with the concept. "You mean, we can have whatever we want, as much as we want?" was a frequent refrain. The slushies and soft serve ice cream were particular favorites. For the rest of the weekend, we played in the snow, we painted a room, we watched movies, we played games, we got our Christmas tree, Code-man had a friend spend the night. This was seriously the best Thanksgiving I've had in a long time, maybe even ever, because I was able to just enjoy the things I am most thankful for: my family, our home, the fact that we have all that we need and more. We had our turkey meal on Friday--I don't think Hubby was ready to go as far as to forgo that particular tradition, although I would have been just as happy without. It wasn't particularly difficult to get the meal on the table, which was a relief--when we're sharing it with extended family it always seems like such a cacophony of chaos ensues in the minutes before we sit down to the Thanksgiving meal. It wasn't a particularly extravagant meal--we did have a few extras on the table, but nothing out of the ordinary. Even so, as we sat down to pray before our feast began, it stuck me as entirely ridiculous that on Thanksgiving we show how thankful we are for all that we have by gobbling up as much of it as we possibly can. It seems a more appropriate response would be to show our thankfulness by sharing our abundance with others who have less to be thankful for. I think my friend Liz (oh my goodness, I used someone's real name in my blog! What has gotten in to me?) has the right idea. This year, for the third time, her family spent the morning of Thanksgiving participating in the Walk to End Hunger at MOA. Liz strives "to be an example of compassion and generosity even if it’s only an example for [her] children," and I think in this, she has succeeded. No, I don't think we should do away with Thanksgiving--there is something to be said for enjoying a special meal in fellowship with family or friends, but I do think that if we are truly thankful for the extravagant generosity of our Creator, our natural response will be to give thanks for what we have been given, and to mirror God's generosity with our own, extending our bounty to others beyond our circle.